I have collected below some factors that will help you decide if your child already need a booster seat, and if you decide so, then you can also choose one from the best booster seats here. Law and WHO recommendations are both included – obviously together with the ADAC advisory. The questions – When can my child use booster seat? Also, how long does my child need it and several other related questions – are the next life-saving (or threatening) topics that you need to be aware of before puchasing. Still and again. I cannot emphasize enough times how important it is that you only choose your seat that has been tested by ADAC. If you do not want your kid’s skin to have direct contact with pollutants, or you do not want him / her to be thrown forward together with seat that separated from the isofix base, or you simply want to make sure as much as you can, that your child is safe while traveling then choose a seat with at least satisfying ADAC result. 2) toddlers in most cases sit in forward-facing seats, or rear-facing in the i-size models. 3) older children, who are not tall enough to sit in adult seats, use booster seats. In 49 states and the District of Columbia and Puerto Rico you must have a booster sit, if your kid is bigger than the safety seat, but not big enough for an adult seat. These are the rules above by GHSA (Governors’ Highway Safety Representatives). For additional information in your state, please check the State Highway Safety Office. The penalty for not following the requirements vary between $10 and $500. 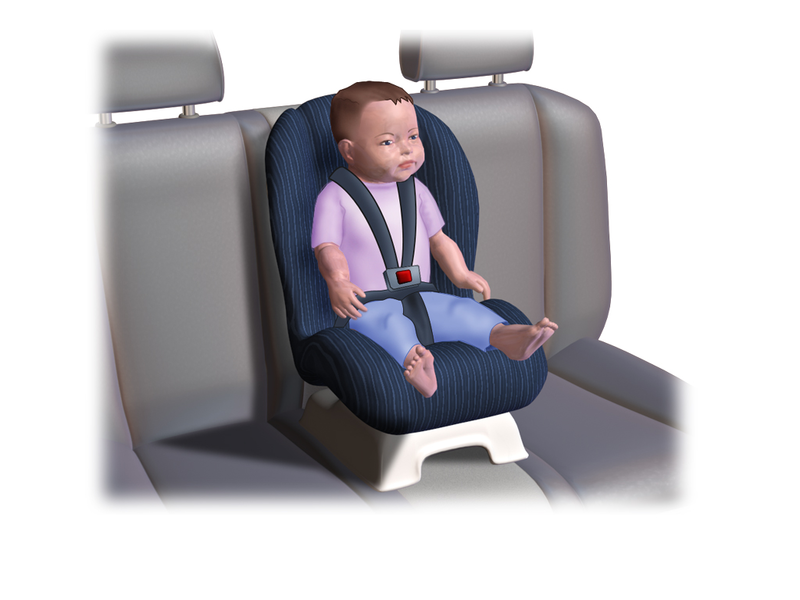 Children have to be at least 135 cm or 12 years (the one they reach first) in order to use adult safety belt. Below 135 cm or 12 years they have to use a booster or safety seat that matches their height and weight. The front passenger seat with a rear-facing safety seat can only be used if the airbags are switched off. Also, it is legal for a child to travel on the first passeger seat if a proper seat adjustment is used. Children have to sit in a car seat or booster seat below 135 cm or 12 years (whichever happens first), above this a seat belt must be used. Airbags have to be switched off if you want to place the safety or booster seat there. Side-facing seats must not be used. Booster seats should be used for children below 145 cm in order to lie the seat belt properly on their lap and chest (and not the neck). Also, make sure that the seat belt does not go across the stomach, as it can cause serious internal injuries in case of an accident. The booster seats for this age range should have back rest and some kind of protection for side impact. Using a booster seat instead of seat belt alone between age 4 and 7, can lower the risk of injury with 59%. These booster cushions are for children between 22-36 kg and in many cases they do not have backrest. However, today most companies provide these seats together with back rest as well. This way, they can be used from 15 to 36 kg. Booster seats with shields in the front should not be used, because according to WHO, they are less safe. Most recent studies also show that placing the safety or booster seat in the middle of the rear seats also reduces the risk of injury than putting it to either of the outer seats. You should get a booster seat with back rest and side impact protection, if possible without a shield as soon as your child does not fit into the child seat any more. This type of seat can usually be used between 15 and 36 kg. Also, make sure that you choose a booster seat that ADAC has already tested and got a satisfying result. Check your local regulations as well. There are general regulation both in the United States and in the Europen Union but each state and country can add further regulations. Not keeping them can not only end up in a penalty but you also risk your child. Place the child seat in the center of the rear seats. This way you may protect your child from serious injuries and probably even death.